This work was originally published in 1996, by Harwood Academic Publishers, and is still in print. It develops a theory of the normal functional differences between left and right hemispheres, based on a simple premise about conduction time in cortico-cortical axons: It is postulated that, in the right hemisphere, conduction times tend to be short, while in the left they are longer, constituting a â€œrepertoire of delay linesâ€. This â€œcentral hypothesisâ€ has some support from biological measures (such as brain morphology, electrophysiology), but much of the book is devoted to showing how, with this assumption, a wide range of psychological differences between the two hemispheres can be explained – in the areas of perception, motor control, sustained attention, contents of memory etc. A section also deals with the correlations between these aspects of asymmetry. The â€œcentral hypothesisâ€ for this work is closely related to that used in a much larger work, â€œA Neurodynamic theory of schizophrenia and related disordersâ€ (Miller, 2008; details on this website). The work on normal cerebral asymmetry was undertaken in the early 1990s specifically because a prerequisite for any theory explaining schizophrenia as an abnormal variant of cerebral asymmetry has to start from an adequate theory of normal asymmetry. 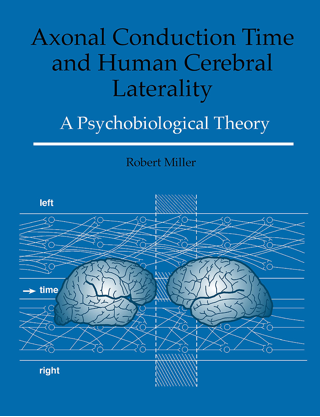 â€œAxonal Conduction Time and Human Cerebral Lateralityâ€ is still available, and can now be obtained from Taylor and Francis/CRC Press, or from Amazon.com (price new: $169.95; used and new: from $104).